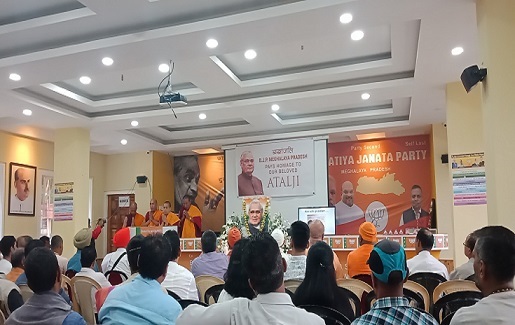 BJP leader, Nalin Kohli arrived in Shillong on Friday evening and took part in a prayer meeting for former Prime Minister late Atal Bihari Vajpayee which was attended by various religious leaders at the BJP office here. The ashes of Vajpayee would be immersed in the Umshyrpi river here on Saturday. “The all faith prayer meeting for Vajpayee was a good reflection of what our Constitution is and its strength, because India is a constitutional democracy where all in 1947 – Chirstian, Hindu, Muslim, Sikh merged our respective religious identities into an Indian identity. We enjoy our own individual freedoms guaranteed by the Constitution including religious path that we chose,” Kohli said. Kohli said that Shukla has been with the Congress several years ago and it was unfortunate that someone was trying to politicize it. “May be she wants to remind everybody that she is related to Vajpayee but she parted ways with the BJP several years ago. She had also contested elections on a Congress ticket. That’s why she is trying to politicize it. Kohli also said that this was not the first time that the ashes of former Prime Minister were taken across the county, as this had also happened with several Prime Ministers including Jawaharlal Nehru and Indira Gandhi whose ashes also went to several states in the country.